Two more of our absolute favorites published this year--The first you may have heard about, it was just listed as one of the New York Times best illustrated books of the year. You may not have heard of this second title, but we consider it a hidden gem. The Invention of Hugo Cabret by Brian Selznick is a marvelous novel about Paris, a train station, clockwork, film, a mechanical man, pursuing your dreams, an inventive orphan, discovery, hope, a bookish girl, and--above all--believing in your imagination. At times the story is told purely through illustrations, this is great for kids handling chapter books on their own, but would make a wonderful family read-aloud. Sure to be a classic, pick up this treasure of a beautiful book. 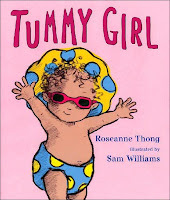 When Diane looks at the illustrations in Tummy Girl by Roseanne Thong and Sam Williams, she gets major baby craving. Who could resist those round little bellies and chubby legs or those brown curly locks on the preschool prima ballerina? This is a sweet sweet story about your little girl and how she will always be your little girl-- always be your tummy girl-- no matter her age. Tummy Girl is a great gift for any girl in your life, whether she is newborn, celebrating a birthday or graduation, or just because you want her to know how dear she is to you.